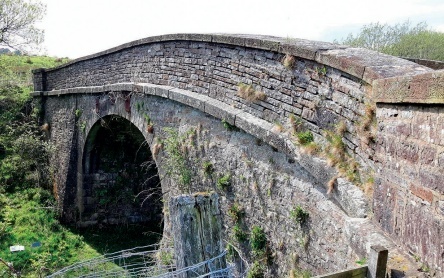 A weathered bridge over the South Tynedale Railway with long-term seepage causing vegetative growth and general dilapidation. Rainwater trickling through the structure acts as a solvent, causing binder dissolution and the loosening of masonry. 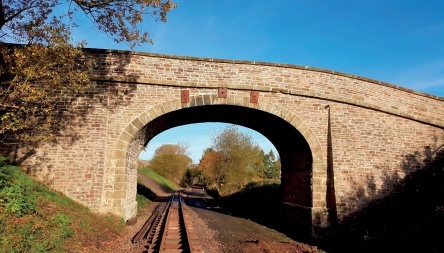 Masonry bridges form a central part of the UK’s built heritage. Of renowned durability, these structures typically require only modest maintenance to ensure lengthy service lives and are eminently sustainable. Many embody the engineering feats required of the industrial revolution and, even when redundant, our great viaducts enrich the landscape they have become a part of. Historic bridges are worth looking after. The durability of masonry bridges is a product of both the masonry arch construction form and the materials used. The masonry units, whether bricks or stones, were generally selected on the basis of proven track record or descriptive quality ‘…the best (stone) from…’, and the mortar materials were selected according to the hydraulic set required, ranging from feebly to eminently hydraulic. In some cases, the quicklime used was naturally hydraulic, while in others ‘fat’ limes were pozzolan-gauged (see Glossary). Ancient pozzolanic fat lime mortars have proved exceptionally durable (as illustrated by surviving Roman examples), while bridges constructed since the mid-18th century are usually found to have been built using hydraulic lime, and can also exhibit pozzolanic aggregates or additions such as fuel ash. Despite the inherent durability of these materials and the robustness of their construction, masonry bridges can be vulnerable to decay as they generally have aggressive service environments, and significant damage can be inflicted on them where incompatible interventions are effected. Cement mortars are the familiar example. Correct specification of repairs is vital, but while the structural aspects of repairing masonry bridges are well covered by existing literature (see Further Information: Sowden, for example), fabric repair is less well examined in the civil engineering field, although it is widely acknowledged that repair mortars should ‘probably’ be lime-based. 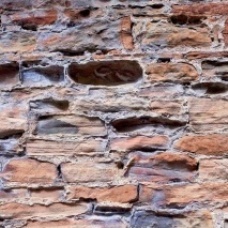 Above left: A mortar bed-joint between arch barrel voussoirs at Brougham Castle Bridge, showing the intimate bond between lime-rich original mortar and masonry units. Note the lime inclusions, general creamy colour and coal fragments in the mortar. Note also the reprecipitated lime (calcite) on the surface of the sandstone. Centre: Typical example of the damage caused by cement mortars on traditional masonry substrates. Note the salt precipitation through the stone and prominent position of the cement mortar. This incompatibility between mortar and masonry substrate forces the harmful evaporation front into the masonry unit, away from the mortar. 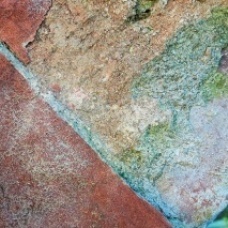 Right: A pronounced example of sacrificial weathering at work: here a traditional lime mortar is actively preserving the masonry units by drawing out the water from the stone with its salt contaminants. 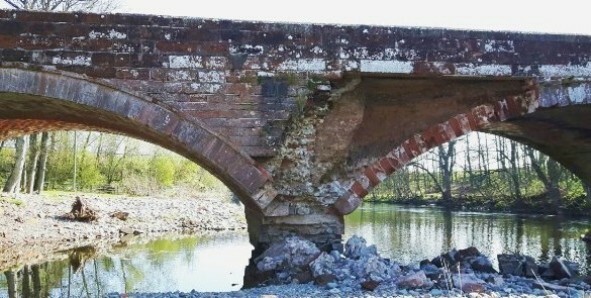 The Scottish Lime Centre Trust has recognised this problem and hosts a ‘Repair of Masonry Arch Bridges’ masterclass which includes fabric repairs as a key component. Correct specification is essential for fabric repairs to be compatible with the masonry substrate, durable, and actively contribute to the continued healthy service life of civil engineering heritage structures. Lime mortar is central to this functionality of fabric repairs. structurally-induced damage/weaknesses established in masonry. Visual observations can be supplemented with intrusive targeted coring works to give a clearer picture of constructional form and detail. Cores can be used to analyse physical and mechanical data of mortar. Trial pits through the deck-fill can help confirm hidden structural details such as the form of the abutments and springing conditions, and underwater surveys by divers can yield vital information on foundations, substructure and scour-protection conditions, which would form part of the wider repair strategy in bridge repair work. Civil engineers in the late 18th century rediscovered the ancient art of mortar-making as perfected by the Romans. Notably, John Smeaton combined hydraulic limes with pozzolanic aggregates to overcome the challenges of constructing the Eddystone Lighthouse (1755-59), and his work probed the chemistry required to achieve an underwater set, a vital characteristic for constructing bridges across rivers, maritime/dock works and deep foundations. Pore size distributions of traditional lime mortar, sandstone and cement grout interacting in a bed-joint at Glasgow Cathedral. Note the lime is a very effective poultice relative to the coarse-pored sandstone, whereas the cement grout is a very effective plug to inhibit escape of water, owing to its dense microstructure. Thomas Telford is known to have specified Charlestown lime by name in much of his bridge-building work across the UK. Its source, on the Firth of Forth, was at the time a famous producer and exporter of moderately hydraulic lime. Another limestone famed for its hydraulic properties was the Blue Lias from Somerset and south Wales, which was widely used in bridge and dock works throughout the UK. According to AD Cowper’s classification system these limestones yielded both moderately (C2) and eminently (C3) hydraulic quicklime. C3 eminently hydraulic quicklime (eg Blue Lias): >60 per cent free lime; 25-35 per cent reactive clays. Historically, mortars tended to be ‘hydraulic enough’ to cope with practical set requirements. Hydraulic limes were always used in rich mix proportions as they would take less aggregate than the ‘fat’ limes often used in general building mortars. Mix proportions of 1:2 were common, and richer still for exacting work. 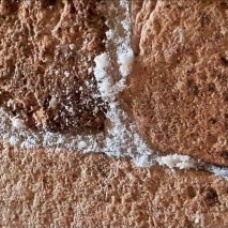 The lime richness exhibited by original lime mortars used in bridge building is often obvious on close inspection (illustrated above). The general consensus is that old bridge-building mortars were typically low strength and, by inference, low modulus (high deformability). In Dibdin’s investigation into hydraulic limes (see Further Information), Blue Lias quicklime from Rugby had a strength of around 1.9N/mm2 strength at 28 days (c 3.7N/ mm2 at two years) when mixed with an ordinary sand aggregate in the proportions 1:2. This is roughly equivalent to a modern NHL 2 based mortar. The strength increased to some 3.6N/mm2 at 28 days (c 6.2N/mm2 at two years) when mixed 1:2 with ground brick aggregate (as used at the Eddystone Lighthouse). This is roughly equivalent to a modern NHL 3.5 based mortar. Dibdin’s limes exhibited slightly higher 28-day strength than the roughly equivalent NHL, although they had slightly lower strength at two years. Natural cement also formed part of the bridge-builders’ palette of materials after its invention in 1796. It was famed for its rapid setting abilities (a matter of minutes), its ability to set underwater, and its tenacious bond to stone, brick and metal. These properties were exploited in the building of dock walls, specifically in the pointing to overcome tidal washout of the slower-setting hydraulic lime behind. Natural cement is no longer produced in the UK. The nearest alternative is Prompt natural cement, which is produced by Vicat in Grenoble, and is readily available as an import. According to the data produced by the manufacturers, Prompt is very close in Young’s modulus to St Astier’s NHL 5. Prompt/ NHL hybrid mortars can be used to significant practical effect in the design of compatible repair mortars for the repair of civil engineering heritage masonries, to grapple with similar challenges faced by the original bridge/dock-builders. To ensure that repairs are compatible, the conservation engineer is tasked with replicating the mineral composition of the original mortar as this imparts and hence determines functional behaviour. This design process should also take into account the practical challenges presented by varying and often aggressive environmental requirements, such as underwater conditions (river and tidal flows) and cyclical wet-and-dry contexts, as described above. state of immersion below water line. For areas below the water line, the role of the mortar is mechanical only: a deformable cushion to regulate stresses between units and fill the joints. For areas of high flow-rate or impact damage susceptibility such as cutwaters, the role of the mortar is also to bind the units together to create an intimate seal against scouring water flow. Mortar needs to elastically and plastically deform to regulate stresses in the masonry units. Above the water-line, the role of the mortar is both mechanical and physicochemical, in that it should actively dry the masonry fabric out (a process known as ‘breathing’) and draw the salt contaminants away from the masonry units. The active agent responsible for this breathability is the uncombined calcium carbonate (CaCO3 ) in the set mortar. Designing for ‘breathability’ depends on ensuring that, when finished, the mortar joints contain a high proportion of porous calcium carbonate. Running water (rainfall and rivers) acts as a non-saturated solvent, leaching free lime from the binder. However, significant loss of lime only takes place over a long period of time and is an unintended consequence of the desired moisture-movement pattern through the mortar joints. Running water also acts mechanically, washing out friable cores for example. Repair mortars should be designed pragmatically, both to ensure compatibility with the masonry units, and to suit the particular context at hand. For example, an eminently hydraulic ‘underwater-mortar’ should not be the first choice for the care and repair of superstructure masonry fabric, where the primary role in that context is to encourage drying out with an emphasis on the sacrificial behaviour of the mortar. It should nevertheless be recognised that owing to the aggressiveness of the service environment in which it must function, the service life of masonry in civil engineering structures may be proportionately shorter than that observed in built architectural heritage. The use of cementitious mortars has caused significant damage to historic masonry in a very short time frame, particularly when compared with the lengthy service lives of these structures prior to the use of cement repairs. These mortars are now recognised as incompatible because of their functional behaviour. They do not deform, they crack and stress the masonry units leading to further cracking and splitting. Furthermore, they do not ‘breathe’ owing to their dense microstructures, effectively ‘plugging’ the mortar joints (the normal escape pathway for water in the fabric). Together, these aspects combine to accelerate the decay of an otherwise highly durable structural medium. The bridge over the South Tynedale Railway Bridge from the first illustration as repaired, with rehabilitation work for the narrow-gauge steam railway underway. The bridge repair contract included a waterproofed saddle and better deck drainage. Note the brightened colour of the bridge fabric after the masonry has dried out. The accelerated decay caused by the ‘plugging’ of the mortar joints is triggered by the disruption to the evaporation front of the masonry around the joint. Where a traditional lime mortar has been used, evaporation of the moisture would occur through the joint, leading to the precipitation of soluble salts in the (sacrificial) lime mortar (see right-hand illustration below title illustration). The use of cement, however, forces evaporation to occur in the masonry units rather than the mortar (see centre illustration below title illustration). 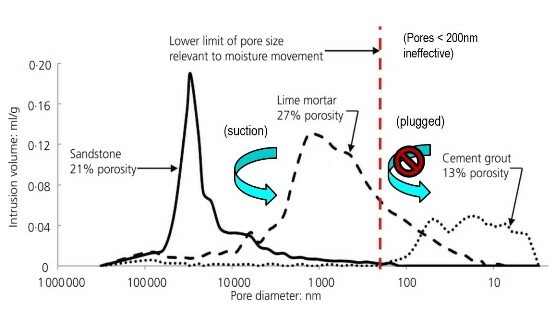 Salts are harmless in solution but when the water they are dissolved in then evaporates, they precipitate to form needle-like crystals which stab the porous matrix, breaking down the masonry fabric at a microstructural level. The restriction of the masonry’s ability to dry caused by cement mortars also leaves it prone to frost attacks, compounding the decay issues. Together these decay processes establish micro-cracks, which eventually coalesce to form macro-cracks and ultimately complete disaggregation of the masonry unit. Hydraulic lime is no longer manufactured from the UK’s traditional sources, and imported NHLs can have unexpected consequences for the unwary. Fat lime a relatively pure lime (calcium hydroxide, Ca(OH)2) containing no more than six per cent calcium silicates and calcium aluminates: also known as non-hydraulic lime, it sets solely by carbonation, a chemical reaction with carbon dioxide which, in the presence of moisture, slowly converts calcium hydroxide to calcium carbonate. Hydraulic ability of a lime mortar to set and harden primarily by chemical reaction with water: the property may be a consequence of using a lime (calcium hydroxide) containing calcium silicates and calcium aluminates, or it may be achieved by gauging a fat lime (relatively pure calcium hydroxide) with a pozzolan. NHL a natural hydraulic lime made from a limestone rich in aluminosilicates which sets primarily by chemical reaction with water, but also by carbonation (see Fat lime, above). NB the acronym is unfortunate because it is easily confused with non-hydraulic lime. Pozzolan a material containing finely powdered silicate and aluminate minerals which can react with lime (calcium hydroxide) in the presence of water to produce a hydraulic set. Quicklime principally calcium oxide, an unstable material which reacts vigorously with water to form calcium hydroxide: it is made by ‘calcining’ limestone (calcium carbonate) by heating it at around 800-1,000°C in a kiln. There is widely available data on the minerology of the various indigenous limestones used in mortar-making for bridge-building throughout the UK. Although there is limited available data on the as-calcined properties of the quicklimes produced in the past, chemical engineering allows us to predict their likely characteristics under given burn controls (temperature, time). Further research into the performance characteristics of original bridge-building mortars is required. However, a working approximation for target as-calcined characteristics of hydraulic quicklimes can be made using the historical classifications for hydraulic quicklime and review of original mortar recipes (see Further Information: Eckel, Dibdin). The palette of modern NHL classifications cannot match the free lime content of the historical quicklime classifications, and natural cements contain practically none. As free lime is a vital function-imparting component, giving breathability, drying out capability, sacrificial behaviour, deformability and autogenous healing, it is important to carefully consider the context when specifying them. The lack of lime richness in NHL and natural cement binders should be compensated for where used above the water line, for example by using an aggregate of crushed limestone (CaCO3 ). Quicklime CL90 grade (>95% CaO) typically doubles in lime yield upon slaking according to the Cowper ‘Class A’ (fat) classification, and therefore should be the first choice ingredient for raising the free lime content of the mortar, to replicate the functionality of historic examples. Gauged quicklime-pozzolan mortars are very effective for achieving lime-rich mortar mixes and a controlled amount of hydraulicity. Modern pozzolans such as metakaolin tend to be more reactive than the traditional brick dust/fuel ash counterparts and the lime-demand of each should be recognised. From an aesthetic perspective, lime inclusions are visually authentic which is a welcome by-product of getting the composition right. Stone for replacement masonry should be geologically compatible or matched to the original, and should comply with BS 5390:1976, selected on the basis of proven track record. Mortar joints should be fully filled and flush pointed (the most durable). To conclude, significant practical challenges are presented in the repair of masonry engineering works and a pragmatic approach to repair mortar design is needed. Historic lime mortars are binder-rich and the binders themselves are typically lime-rich. It is the lime-richness above the water-line which actively dries the masonry out, and preserves the masonry units by weathering sacrificially. The original lime-richness should be replicated in the design of compatible repair mortars to ensure this continued functionality. While the original hydraulic lime binders are not currently available commercially, the existing palette of CL90 quicklime, NHLs, pozzolans, Prompt natural cement and microporous calcitic aggregates can be adapted to obtain a compatible mortar which is a fair replication of the original, in terms of mineral composition and hence functional behaviour in service. DAVID WIGGINS BSc(Hons) PhD IEng MICE undertook doctoral research into the functional behaviour and technical conservation of heritage masonry at Glasgow Caledonian University. He is a structural engineer, part of the Conservation and Heritage team at Curtins Consulting Ltd. His work centres around the structural repair and conservation of architectural and civil engineering heritage.